This past weekend, some friends were in town staying with the bf. So I thought I would make a sweet treat for him to have on hand for his guests. 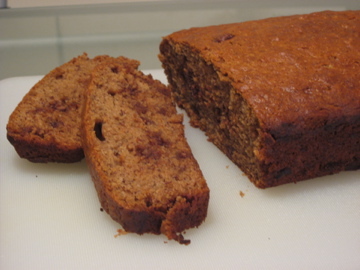 I had recently saved this recipe for banana bread because I was intrigued by the combination. 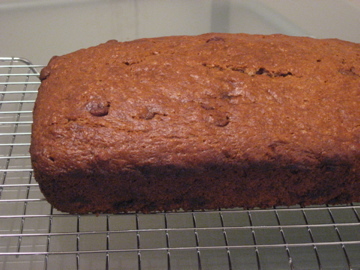 I have another recipe for banana bread that I will share with you another time but I felt like trying something new. To be honest, the loaf didn’t turn out as I expected. I didn’t use the peanut butter chips and maybe that would have made a difference because I found the flavour was neither here nor there. It could have either done with a little stronger banana flavour or a little more peanut butter (through the chips). Also, from making other banana recipes in the past I think it may have something to do with using frozen bananas. Does anyone else find that the flavour is never as strong if they have been frozen?? On a side note, it was my most successful loaf removal from pan so if nothing else I gained practice at that! You can check out other yummy recipes at The Repressed Pastry Chef or give this one a try and see if you have better luck! I love pumpkin desserts and this cake was no exception. I like to call the pumpkin treats whenever they show up on the TWD recipe list, fortunately Claire let me have this one as well. I baked this on the weekend for S. and his family. Sometimes I give away my baking and I forget to take pictures (okay a lot of the time) but this time I had the foresight to make a mini-bundt for me, in addition to the large one. And I sure was glad I did, as this cake was delicious. I made the maple glaze to go with my mini-bundt. Seriously, adding maple to anything is a recipe for success. Thanks to Britin of The Nitty Britty for choosing a great recipe. Go check out the antics that the other bakers got up to over at Tuesdays with Dorie. You remember the peanut butter cake, right? 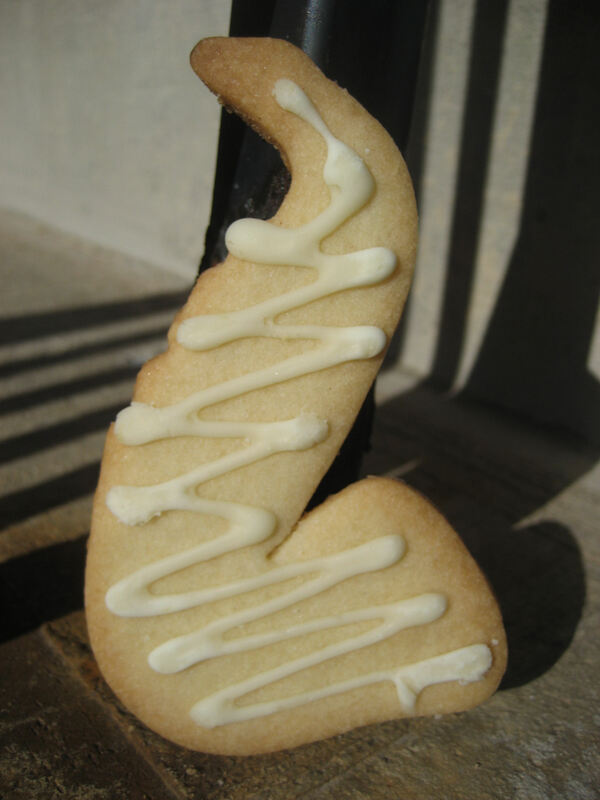 Well, these saxophone cookies were for the same party. As I mentioned, my favorite baritone saxophone player had a birthday and in addition to the cake, I wanted to treat him to saxophone cookies, he’s kinda hard-core about music. A special thanks to my mom, my niece, Kristin and Teresa for helping out with the cookies. They were truly a collaborative endeavor. Did you know that today is National Bundt Day (at least in the United States anyways)? I know because Mary The Food Librarian has just finished 30 days of Bundts, affectionately named I Like Big Bundts. Mary’s blog is awesome and she is a bundt aficionado and thus, we were treated to 30 days of bundts. 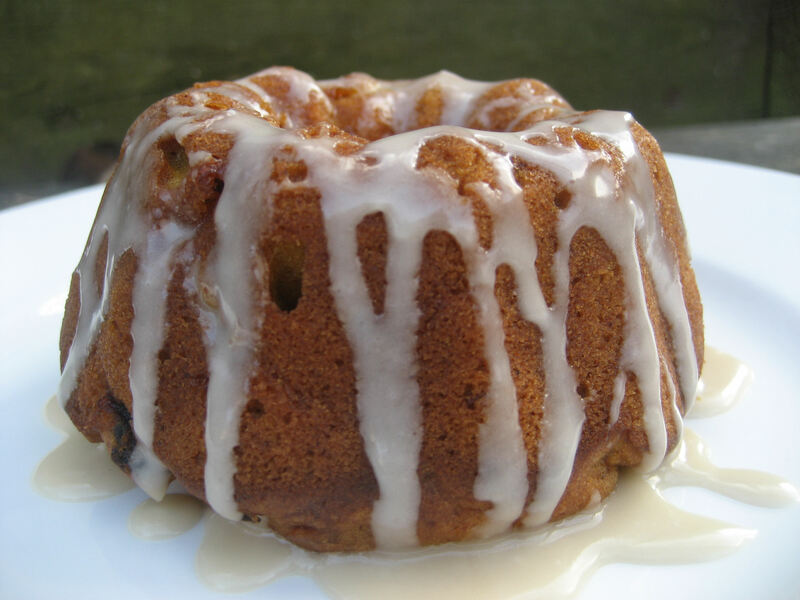 I couldn’t let the day pass without getting in on the action so I made the Pumpkin Apple Bundt from day three. I was tempted by many of them and I am sure that I will refer back to them when the bundt urge hits again. Thanks Mary for such a great event! Post photo taking I added a Maple glaze to the cake. I mixed icing sugar, maple syrup and a bit of water (you could use milk but I didn’t have any). I think this added a little something special, a good improvisation if you will. OK, so I know we have been slacking here at Bake with Us. We have missed the last two TWD posts and we haven’t been posting much else. My only excuse is that I have been so busy baking (and partying with friends), that I haven’t had time to blog. Lame I know, but on the bright side I am having tons of fun and sharing the baking love. Sorry to our virtual friends, I will try and it make up to you over the coming weeks with lots of posts. So this past weekend was my favorite baritone saxophonist’s 30th birthday. He has this thing for peanut butter and so I wanted to hook him up with a peanut butter cake. Peanut butter isn’t my favourite so I was worried about finding a good recipe. I went straight to some of my favorite blogs and found success over at Smitten Kitchen. Deb’s recipe is great. I decided to omit the chocolate glaze and the extent of my artistic license was the addition of chopped peanut butter cups. 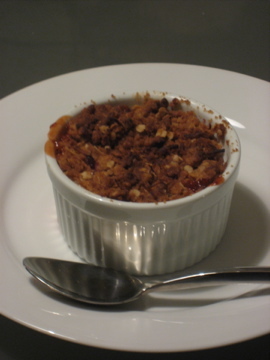 I added finely chopped pieces to the middle layer and then coarsely chopped ones on top. Confession: I didn’t actually eat a piece but it looked fabulous. I ate some saxophone cookies, which will soon be appearing here. Stay tuned for more 30th birthday party recipes. I made a few changes to the recipe to avoid having to buy extra things! I didn’t have any self-raising flour so I followed Baking Bites suggestion on how to make your own. I also didn’t have Skor bars and so instead I used Skor bits and milk chocolate chips. I probably put 1/3 cup of milk chocolate chips and 1/4 cup of Skor bits into the cake and then sprinkled the top with an additional 1/2 cup or so of bits. My only issue was the baking time, I probably added 6 minutes.